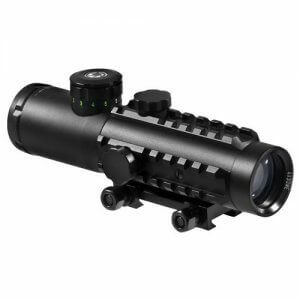 The AR 15 combat rifle platform is built to work like a dependable precision tool. 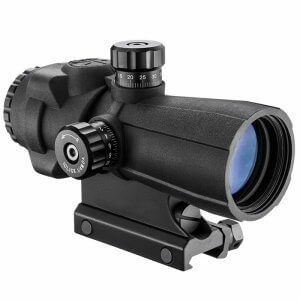 AR 15 scopes are designed to enhance the accuracy and performance of this precision tool. 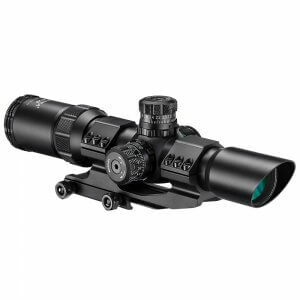 Tactical Scopes designed for the AR15 have a wide range of targeting functions, but the two distinct targeting methods are quick acquisition close quarter targeting and long range targeting. 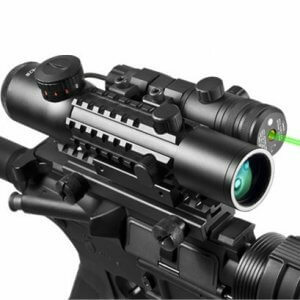 AR scope technology has advanced so much that the modern shooter can take advantage of both shooting styles at the same time. 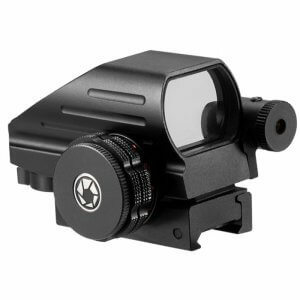 More then one targeting points can be achieved with a combination of a main magnified optical scope, a secondary quick targeting compact sight, and a third targeting point which can be achieved with an AR 15 laser sight. 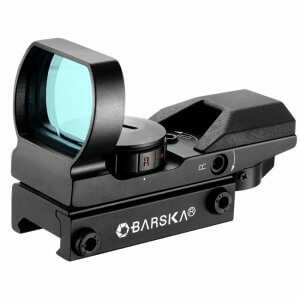 Barska is one of the few manufacturers of professional military optics that designs many types of AR 15 sights, from long distance scopes to tactical laser sights. 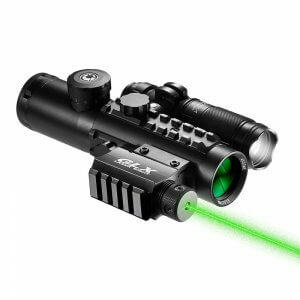 Long range AR 15 scopes, like the 6-24x50mm sniper scope by Barska with green mil-dot are built for distances of 50 yards to over 300 yards. 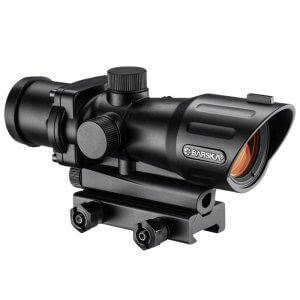 The SWAT sniper scope by Barska is built to the high specifications of extreme long distance shooter. 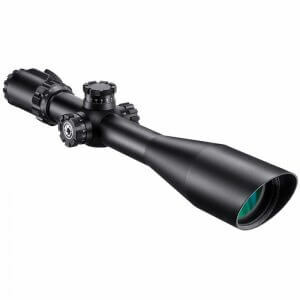 The SWAT series features one of the longest distance rifle scopes, the 10-40x50mm Swat scope. 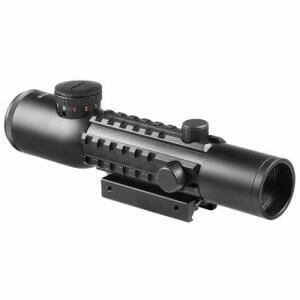 This scope can target distances of up to 1000 yards with larger AR rifles such as the AR-10. 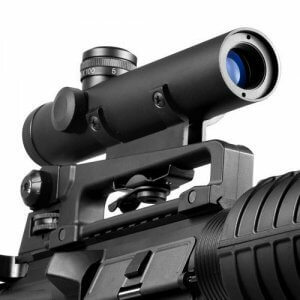 Modern use of the AR 15 combat rifle has changed from a military rifle to hunting, home defense, and recreational targeting shooting rifle. 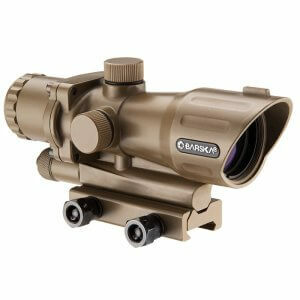 Barska is a leading manufacturer of tactical rifle scopes, military style optics, and laser sights. 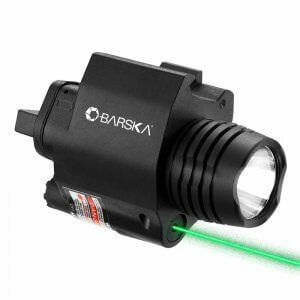 In addition to rifle scopes, Barska also produces a wide range of AR 15 accessories such as AR 15 grips, AR 15 bases and gunsmith tools. 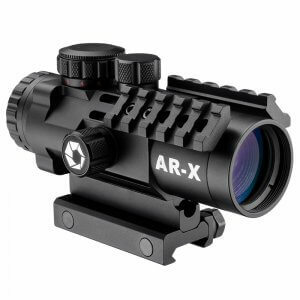 AR 15 sights for quick target shooting or close quarters shooting requires a sight with little to no optical magnification, but relies more on a bright visible reticle and wide field of view. 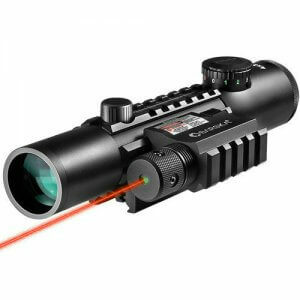 This type of shooting requires that the sight or scope can help guide your eye to the target quickly and without obstructing your view. When choosing a quick target shooting AR 15 sight smaller is better, the less the sight obstructs the shooter view the easier it is to quickly track down and target. 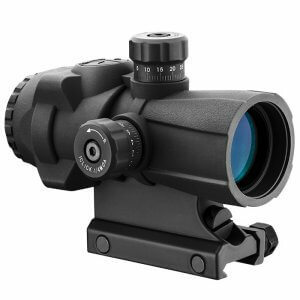 The shooting range of an ar 15 sight with no magnification is going to be from point blank to 50 yards max, they can be used for longe distance targeting, but when shooting longer distances you have more time to sight in your target with a ar 15 scope that has high magnification. Tactical target shooting, highly visible AR sights by Barska have become very popular in use for home defense for the ability to quickly target on to a intruder within a close distance. 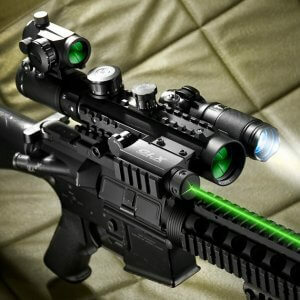 Ar 15 Scopes such as the Point Black series are designed with B.D.C turrets for the .223 bullets. 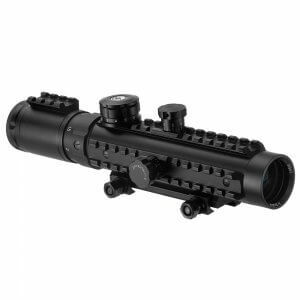 Close distance AR 15 scopes 50 - 150 yards, which is the average target shooters distance, requires a tactical scope with magnification. 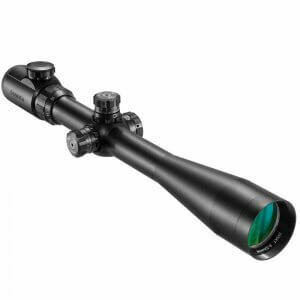 The best option would be a zoom-powered scope with a low minimum magnification of 1x and a high magnification of 4x. 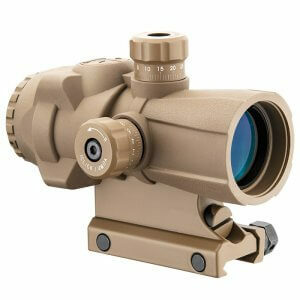 If using a fixed power AR 15 scope for mid range shooting then 4x magnification will work. The advantage of a zoom power AR scope that can go down to 1x is that it can be used in close quarters combat shooting if needed. 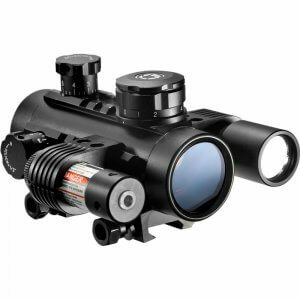 At 1x this is what you see with your naked eye, the close focus at 1x allows you to co-witness the scopes reticle with the rifles iron sight, which is a feature and specification most law enforcement shooters need in an AR 15 tactical scope. 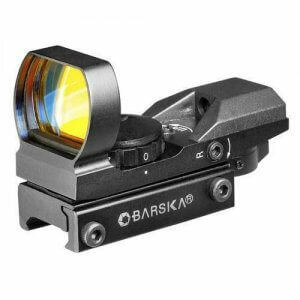 Low power sights / scopes like the Barska Multi-Rail electrosights are avaliblein , 1-3x, 1-4x and 4x powers which can be used with a laser sight for a second aiming point or a long-range co-witness of the targeting point. 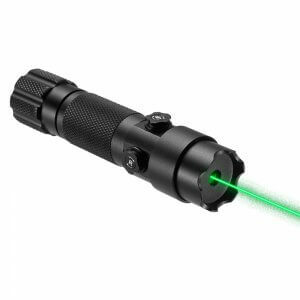 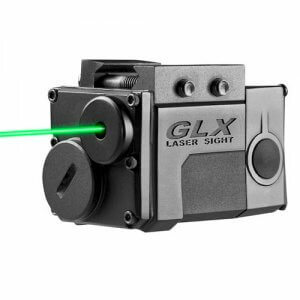 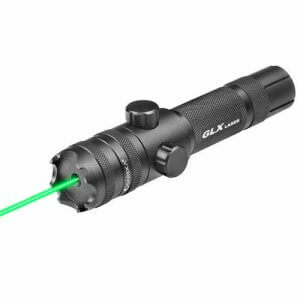 Shooters can zero a mid range scope in at 100 yards and with a Barska GLX green / red laser sight, can light up the target for a distant co-witness. 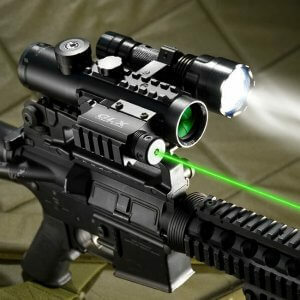 The use of a laser together with an AR 15 scope can give the shooter the ability to designate a different shooting distances with in the scopes reticle. 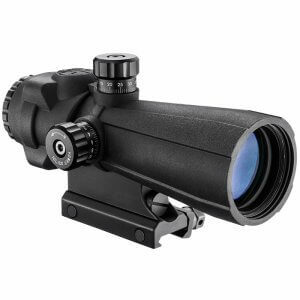 AR 15 Scopes are designed to military specifications for extreme tactical shooting. 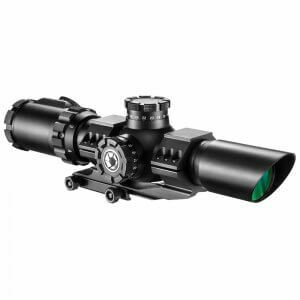 We stock the largest selection of AR 15 Scopes and accessories for your AR Rifle including AR 15 scope mounts, AR15 scope rings, Ar-15 laser sights, AR 15 Grips and more. 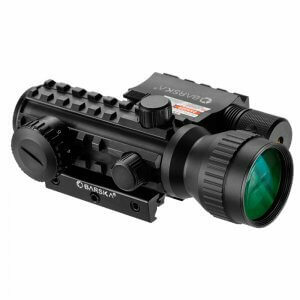 Our AR products are designed for professional use military shooting, hunting and law enforcement. 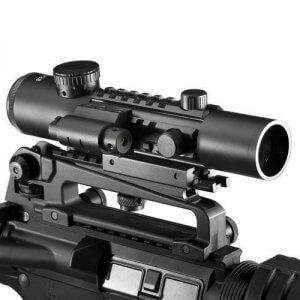 The AR-15 Carbine rifle is one they most popular tactical rifle platforms ever design, we continue to develop new scopes and accessories that are field tested to the highest standards. 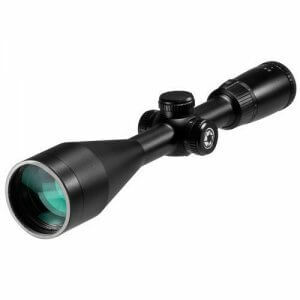 AR15 Scope reviews, Buy AR 15 Scopes at Barska.